NZTA has confirmed that a shared cycling and walking path will be built on the seaward side of the Railway between Petone and Ngauranga (P2N). Construction is expected to begin by 2019. This is great news for solving the P2N “gap” in the Great Harbour Way Te Aranui o Pōneke, making it safe and comfortable for walkers and cyclists to complete the circuit around Wellington’s harbour, Te Whanganui-a-Tara. The proposed 3m wide path will have 1m shoulders allowing for a wider path if demand warrants. 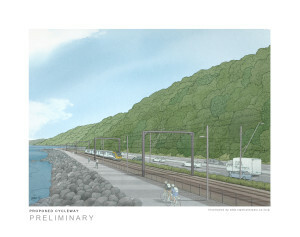 The path will protect the railway line from storms, such as the 2013 event which affected commuters for six days, and had economic impacts of up to $43 million. Wellington Mayor Celia Wade-Brown points out that the path will make the 10km from Petone to Wellington a straightforward option for commuters and recreational users. It will also provide access for fishers to a significant part of the harbour shoreline. Related projects to be funded under the Urban Cycleways Programme will connect the path to Melling and Lower Hutt in the north, and to Thorndon and the Wellington Waterfront in the south. The history of the Petone to Ngauranga path is a long one. In 1900 “large numbers of cyclists were induced by the beauty of the day to ride to the Hutt district. 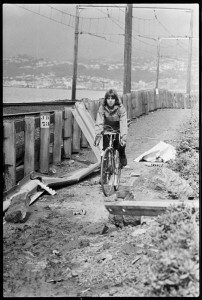 Between Ngahauranga and Petone a narrow path in the centre of the mud had been beaten hard by horses hoofs and hundreds of bicycles, enabling riders to remain in the saddle from town to their destination”. In 1901 Hansard reported Wellington MP Mr Wilford’s proposal that cyclists contribute 5 shillings (about $45) a year to build a cycle track from Wellington to the Hutt, despite parliamentary doubts about the future of transport – another MP opined that “there is not such a a craze for cycling now as there was five or six years ago. Many young men are abandoning the cycle and going back to the horse, and then, the motorcar is going to take the place of the cycle. We have a dozen of these in Canterbury at the present time”. A foot and cycleway was built between the railway line and the road, but a 1911 letter reported that “already there have been several narrow escapes” with motor cyclists using the path. In 1927 the track had been “repeatedly dug up…for the purpose of laying water mains, drains, etc.” A 1929 Cyclists Touring Club ride picked up 1843 nails from the path. In 1930 the track had been damaged by storm and motor lorries crossing to repair the railway line. In 1933 the Lower Hutt Borough Council rejected proposals to repair the cycle track for a cost of around £1800 (about $200 000), even though £600 would have been paid by the Public Works and Railways Departments as compensation for damage done to the track. In the 1980s the road was widened, reducing the cycleway to an unmaintainable width. Today we’ve learned the lesson that private motor cars are not sustainable transport, and the P2N project will be a big advance in Wellington’s active transport and recreation network, connecting the Wellington CBD to the Hutt Valley and the Rimutaka Cycle Trail. This entry was posted in Uncategorized by Alistair. Bookmark the permalink.